A 38 North exclusive with analysis by William Mugford and Joseph S. Bermudez Jr. 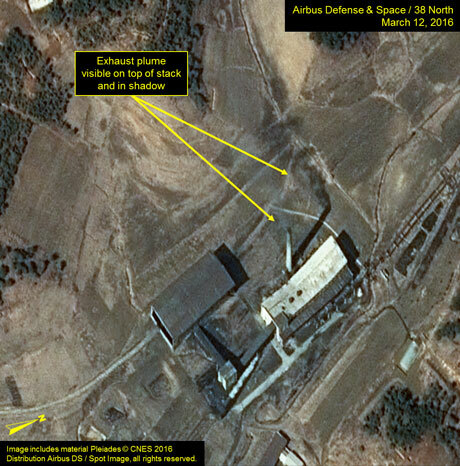 Recent commercial satellite imagery indicates suspicious activity at the Yongbyon Radiochemical Laboratory complex used to produce plutonium for building nuclear weapons. Whether that activity—exhaust plumes from a steam plant used to heat the main plant—means reprocessing additional plutonium is underway or will be in the near future remains unclear. However, James Clapper, the Director of National Intelligence recently stated that the North Koreans could be ready to do so in weeks or months. Pyongyang continues to make slow, steady progress in completing the transformer yard associated with the Experimental Light Water Reactor (ELWR). Whether that means the ELWR will finally become operational in 2016 remains unclear, particularly since previous estimates have proven optimistic. During the past five weeks, exhaust plumes on two, possibly three, occasions were observed at the Radiochemical Laboratory’s Thermal Plant (e.g., steam plant). 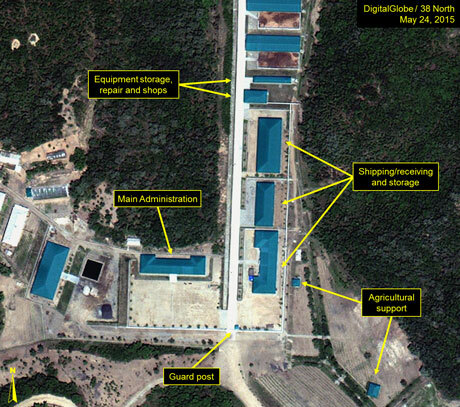 (The laboratory is Yongbyon’s main reprocessing installation to produce plutonium.) This activity is unusual since exhaust plumes have rarely been seen there and none have been observed on any examined imagery this past winter. The plumes suggest that the operators of the reprocessing facility are heating their buildings, perhaps indicating that some significant activity is being undertaken, or will be in the near future. 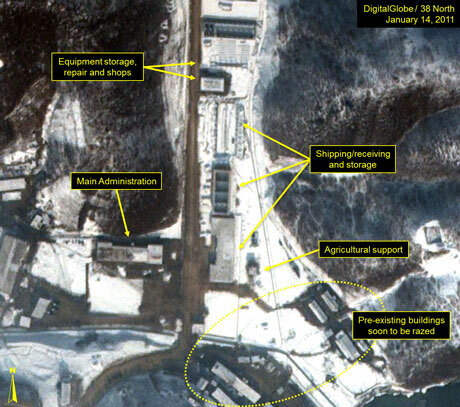 Whether that activity will be additional separation of plutonium for nuclear weapons remains unclear, although in recent testimony, the Director of National Intelligence, James Clapper, stated that the North Koreans could be ready in the coming weeks or months to do so. Figure 1. Exhaust plumes seen at the Radiochemical Laboratory’s Thermal Plant. 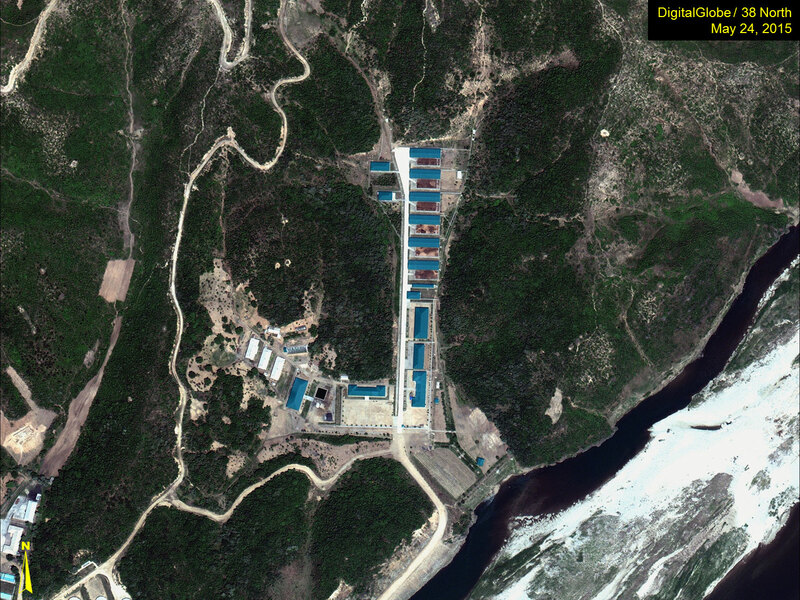 Recent commercial satellite imagery from March 21 indicates continued work at the Experimental Light Water Reactor (ELWR) transformer yard that has been the focus of activity for most of this year. At the end of 2015, a second transformer was installed in the yard. More recently in February, a small truck and what appears to have been a double bucket crane were present. This equipment is common in the United States, and is used in urban areas for repairing or installing power and/or communication lines. The “buckets” on the top of the crane arms appear to be out over the transformer yard and are probably being used to install electrical cables. There is a second vehicle immediately south of the crane and two vertical poles have been installed 60-70 feet southeast of the yard. In Late March, they were still present, probably completing their work. Imagery from March 21 also shows that a road has now been built around the eastern and southern sides of the transformer yard (Figure 2). A bulldozer or similar type of equipment was probably used to build the road as there is a pile of earth all along the outer edges of the new road. Figure 2. Work continues on the transformer yard at the ELWR. Certainly, this activity is a clear sign of further progress towards completion of the ELWR. However, whether it means that the ELWR will finally become operational in 2016 remains unclear. Previous estimates have proven optimistic. 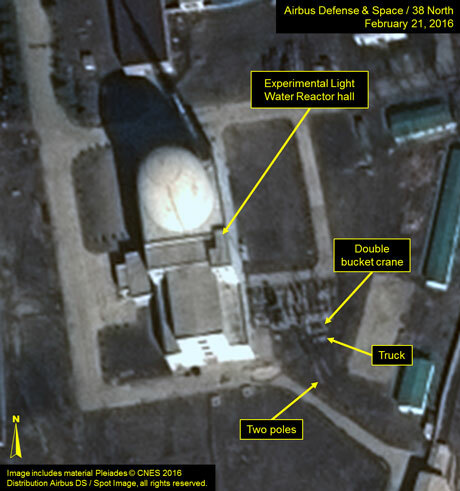 It still remains unclear if the North Koreans have been able to surmount other potential hurdles, such as mastering the production of fuel bundles for this reactor. During the first three months of 2016 there has been no evidence of steam generation or cooling water exhaust at the 5 MWe reactor. However, there was evidence of continued activity with vehicles of various sizes and numbers being moved around the rear of the 5 MWe reactor hall (Figure 3). What the exact purpose of this activity is remains unclear. One possibility is continued maintenance. 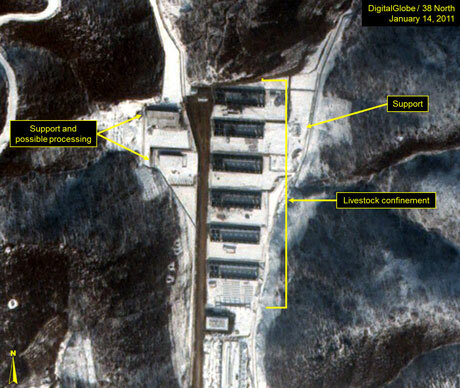 This activity appears to indicate that the reactor is being worked on, perhaps to bring it back into service. Figure 3. 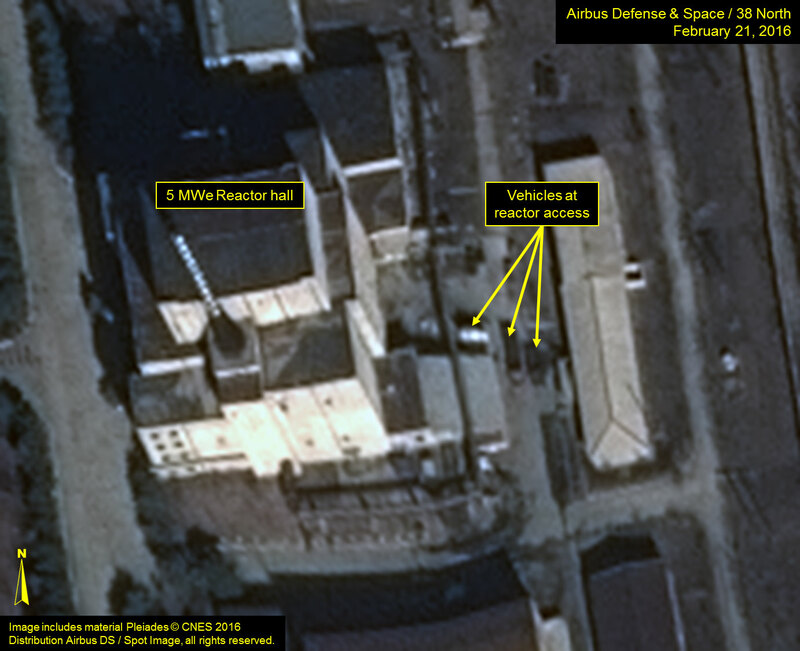 Vehicle activity seen around the 5 MWe reactor. 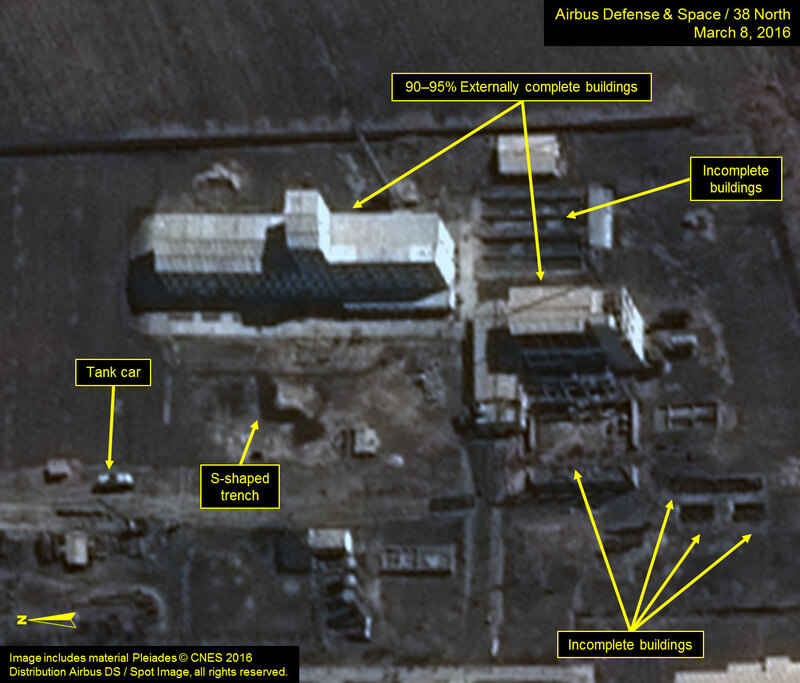 Recent imagery shows a continued high level of activity in the southeastern corner of the uranium enrichment complex. While it has been suggested that the new buildings under construction here are an Isotope Separation Facility, it is unclear whether there is sufficient evidence from imagery alone to draw that conclusion. The two largest buildings appear to be almost externally finished, although it could require years to complete installation of equipment. . Construction on a third large building that has existed for months as a framework has now restarted. There are at least three, possibly four, additional buildings in the early stages of construction (e.g., frameworks, foundations or excavations). The southeast corner of the Fuel Fabrication Complex is served by a rail spur, which is being used for delivering materials and components to the new facility. Among the items that have been observed arriving was a large (10-meters by 3-meters) tank car that has remained parked on a rail siding for the past three months. In the March 21 image (Figure 4), however, the tank car is no longer present. The contents and purpose of this tank car remain unclear. Figure 4. Construction of new facility near the uranium enrichment complex continues. 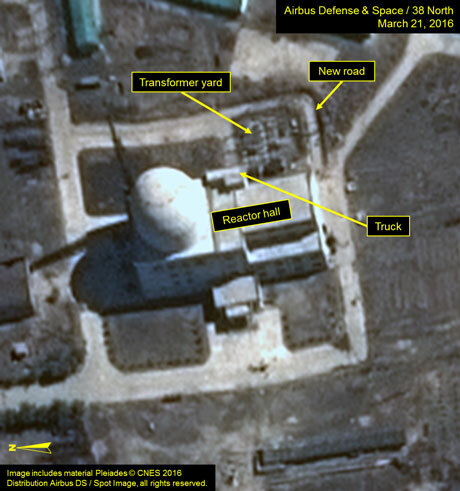 On March 4, 2016 the Institute for Science and International Security (ISIS) published a report in which it raised the possibility that a facility near the village of Tohwa-ri (Figure 5) might be involved in the production of CO2 for cooling the 5 MWe reactor at the Yongbyon, but welcomed comments from other observers. Figure 5. A facility near Tohwa-ri. While CO2 production is neither an overly complex process, nor does it require extensive equipment, work at an industrial scale requires support, production and delivery infrastructure. 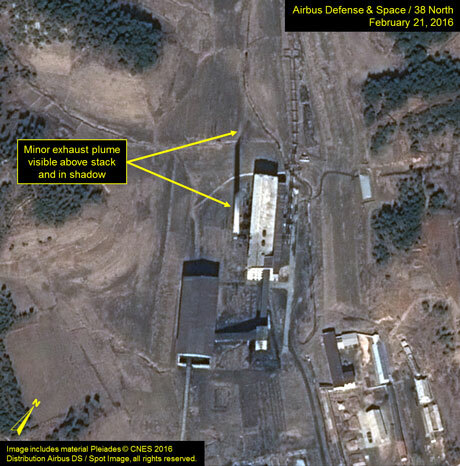 Satellite imagery of the Tohwa-ri facility from 2010-2016 shows no production equipment (e.g., storage tanks—large or small, fans, compressors, etc. ), identifying characteristics (e.g., roof penetrations for exhaust stacks or ventilation, large bay doors, presence of steam or smoke, etc. ), or other activity (e.g., presence of shipping materials, tank or flat-bed stake trucks, etc.) typically associated with CO2 production facilities. Additionally, the internal construction of almost all the buildings at Tohwa-ri is simply not conducive to the installation of anything but the very smallest CO2 production equipment (Figures 6-7). Figure 6. Construction of administration buildings from 2011-2015. Images © 2016 DigitalGlobe, Inc. All rights reserved. For media licensing options, please contact [email protected]mail.com. Figure 7. Construction of livestock halls from 2011-2015. In short, there are no indications of CO2 production at the Tohwa-ri facility. 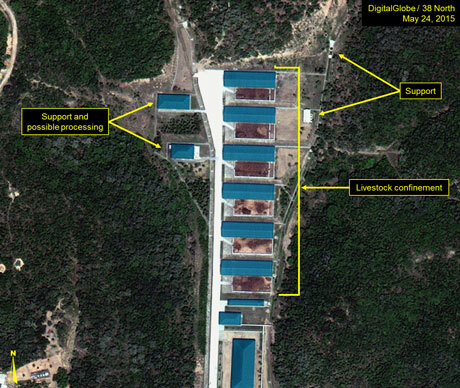 Rather, it appears to be a small livestock husbandry facility similar to many others dispersed throughout North Korea. Moreover, there are no readily apparent reasons why the North Koreans would want to produce CO2 at the Tohwa-ri facility when just 12 kilometers to the southwest is the Namhung Youth Chemical Factory—one of the largest chemical production complexes in North Korea—which has been refurbished and modernized during the past 10 years.